OMG! Did Nintendo just inDIRECTly announce Skyward Sword HD?!!! Nintendo aired its 3DS-focused Direct presentation this morning and one thing stuck out as odd to me. Nintendo of Europe president Satoru Shibata used the same phrasing on the European Direct. As for the Japanese Direct, I’m not sure. My Japanese ain’t that good. So, if there’s only one version of Skyward Sword, why would Nintendo feel the need to clarify that it’s the original version that is going up on the eShop today? 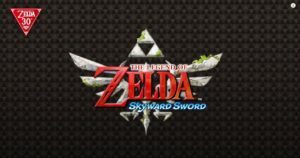 Could it be that an HD edition of Skyward Sword will soon make an appearance? The Legend of Zelda: Twilight Princess HD released last March so it would be surprising to get another HD Zelda so soon but the only major Wii U release for the rest of the year* is October’s Paper Mario: Color Splash so maybe Nintendo feels an HD Skyward Sword will help Wii U owners through the holiday season. Personally, I think Nintendo’s use of “original version” is merely meant to clarify that this is not an HD Edition, Director’s Cut, or anything like that; it’s simply the same game you played on the Wii with no tweaks, embellishments or improvements. That’s boring but I find it more likely. *Yes, there are other games such as Skylanders: Imaginators, Just Dance 2017 and a handful of eShop titles, most of which came out on other platforms long ago such as Axiom Verge, Stardew Valley and Steamworld Heist. Yes, I expected the answer would be no. They just used original word to make it clear it’s the original game, not some enhanced or HD with extra content. I doubt Skyward Sword will have a Wii U release. The console is dead, it’s not being produced anymore, and of course it sold almost nothing. Not worth working on it. NX will have it though, but only some time after the new Zelda is out.